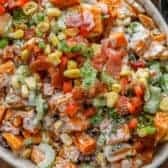 This delicious Sweet Potato Salad Recipe is not only super colorful but it’s absolutely loaded with flavor! With a little prep, it can go from the kitchen to the table in no time at all! A cold sweet potato salad on a hot day is crunchy, savory and oh, so delicious! 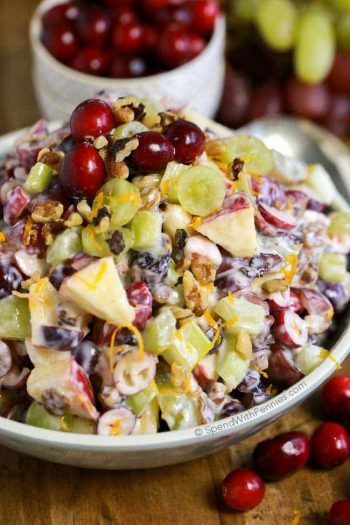 It’s such a beautiful salad for special occasions but easy enough for every day! 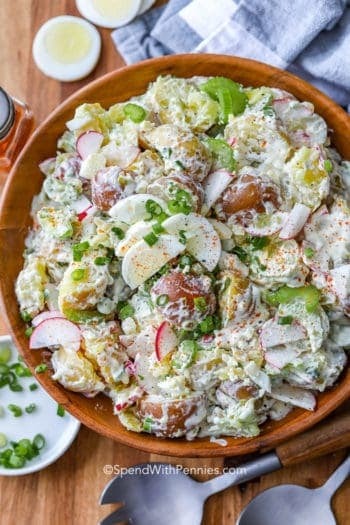 A flavorful twist on a classic potato salad recipe, this recipe tastes even better when it’s made ahead of time making it the perfect potluck dish! Potato Salad has been a summertime favorite forever… and I have no idea why I haven’t been making potato salad with sweet potatoes! 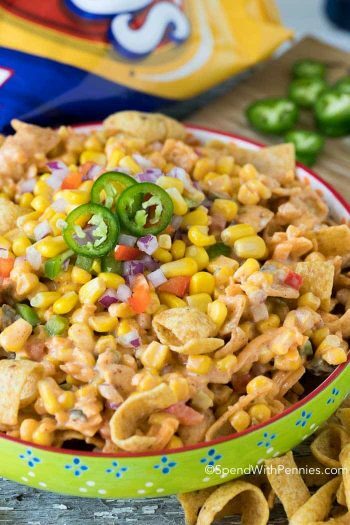 This dish has tons of amazing flavor and we literally cannot get enough! 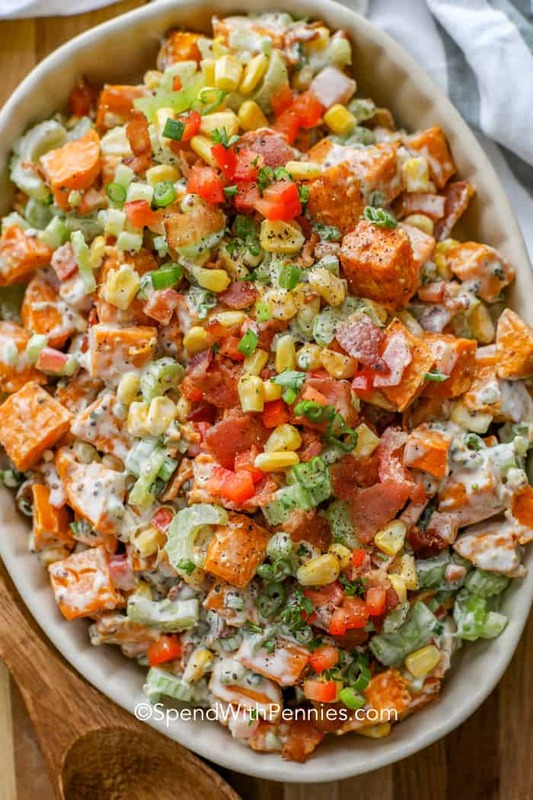 Tender sweet potatoes, crisp veggies and of course crisp smoky bacon are tossed in a creamy dressing, the perfect accompaniment to your favorite pulled pork! Sweet potatoes have a thick skin and unlike russets, they really need to be peeled. Once peeled, I add a bit of olive oil and make tender roasted sweet potatoes to mix into this recipe. 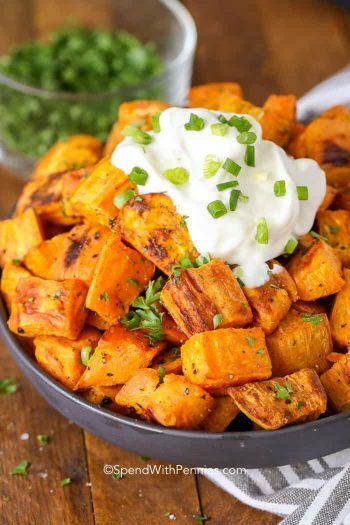 If you have leftover Baked Sweet Potato, they can be used in this recipe as well. 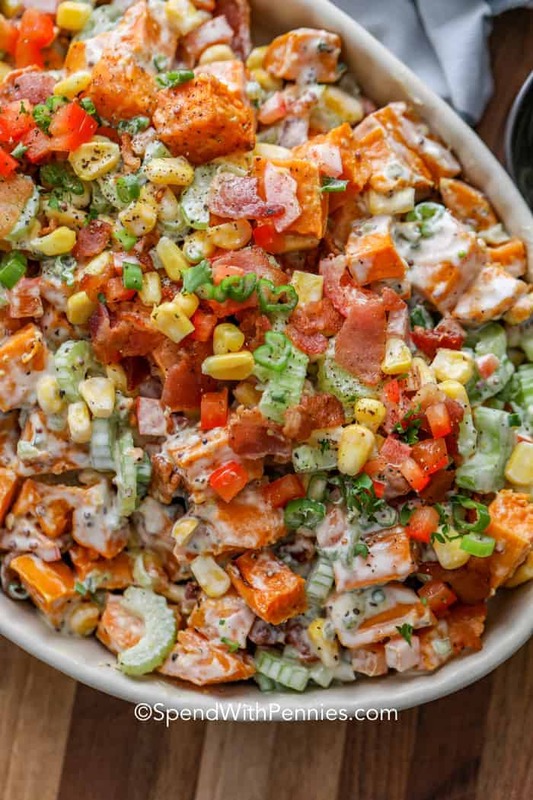 This roasted sweet potato salad comes together quickly but the flavor is out of this world! It’s bright and colorful with a delicious tangy dressing, so much better than store bought! Roast and cool sweet potatoes. Assemble all the dressing ingredients and mix well. Place in refrigerator to chill. Toss cooled potatoes, dressing and other add-ins in a bowl. MAKE IT SPICY: This salad is creamy and a little bit sweet which means that it lends itself very well to the addition of a little bit of heat! Dice a jalapeno or add a small dash of cayenne pepper or chipotle. ADD PROTEIN: Easy Grilled Chicken Breast or shrimp make a great addition to turn this from a side to a main dish. Even leftover baked ham is great in this recipe! ADD KALE: we love a great Kale Salad so turning this into a kale sweet potato salad is another favorite option! Remove the hard stems of the kale and chop finely and add to the salad. Extra color and extra nutrition! It’s a win-win! CHANGE THE DRESSING: We make a zippy creamy dressing to go with this recipe. A dijon or lemon vinaigrette is another great option! Italian Pasta Salad – Classic Pasta Salad recipe! Greek Tortellini Salad – Easy favorite recipe. Chickpea Salad – fresh, flavorful and full of veggies! 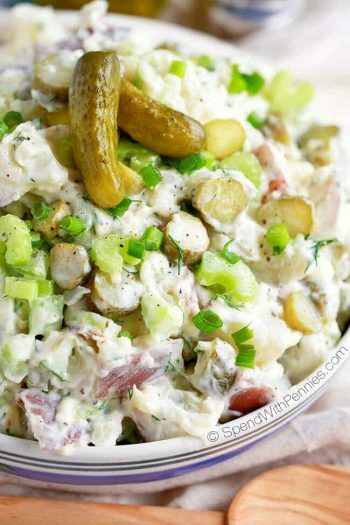 Dill Pickle Pasta Salad – My all time favorite! Broccoli Salad – The perfect potluck recipe! 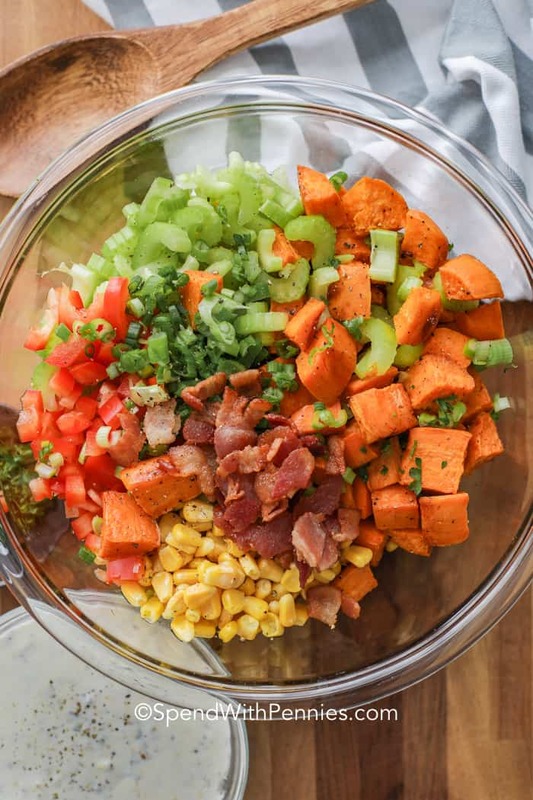 This colorful side dish features roasted sweet potatoes, corn, juicy red peppers and smoky bacon all tossed in a creamy dressing. Toss sweet potatoes with olive oil, garlic powder and salt & pepper to taste. Roast 35-40 minutes or until fok tender. Cool completely. Combine dressing ingredients in a large bowl and mix well. Add remaining ingredients, toss to coat and refrigerate at least 2 hours before serving.